Today when I signed in to Facebook, I noticed a new design on Facebook homepage. It has got few noticeable changes in the homepage. Facebook always keeps on testing different designs of the home page to improve the navigation and other features for users. Facebook has removed the navigation bar from bottom of the page in the new design. Only the Chat tab is left at the bottom now. However you can see the links to chat with your online friends in the bottom of the sidebar. There is no Live feed option in the new design now. You can now access News Feed, Top news and Most recent news only. In the new Facebook design, it is now easier to respond to friend requests, to read messages and notifications as you will find all these in the top left corner menu only. Whenever someone sends you a new message or a notification, you will see a red bubble in the top left corner. News feed, messages, photos, games and other bookmarked applications are all accessible from the sidebar of the new homepage. 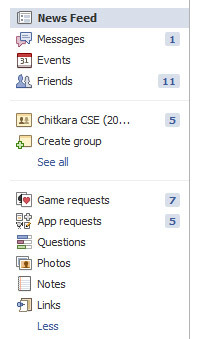 Links to important account settings, application settings, log out, the help centre and more are visible at the top right corner. With the Photos dashboard you can browse recent photos of your friends. I think the new design is better than the previous one with new easy navigation. But we would like to hear from you how you like the new design. .-= Pavan Somu´s last blog ..Download All Google Products in a Single Click =-. I think that the new page is more clear, and simple dividing to three sections make using the whole system more easy and quick. Yeah its more clear but I miss the navigation bar at the bottom. It was very useful. Now we have to scroll the page to open any application from sidebar.